It is no secret that the Trump administration is cracking down on illegal immigrants. 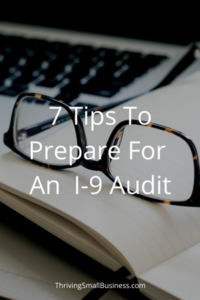 This means, you should prepare for an I-9 audit – because the number of audits are increasing. The Immigration and Customs Enforcement (ICE) is planning to increase its investigations of workplace compliance by four or five times. This means employment eligibility verification audits (I-9 audits) will significantly escalate in 2018. The Employment Eligibility Verification Form I-9 is used by employers to verify an employee’s identity and eligibility to work in the United States. Completing I-9 forms are part of the employment process and keeping accurate and up-to-date records of these forms is an important part of maintaining HR files. This documentation ensures employers are not illegally hiring people who are not authorized to work in the United States. The current administration has taken an aggressive stand and has committed resources to audit employers to ensure compliance. The targets are employers who hire illegal workers. The Trump administration, has been aggressive in its approach to ensure only legal residents are able to work in the United States. As a result ICE is targeting employers who hire unauthorized workers. Fines for employers who knowingly hire and continue to hire illegals can range from hundreds to thousands of dollars and increase with first, second and third time violations. Not only are there fine for noncompliance, but employers can face criminal prosecution if found to have illegal workers. The increased resources that are available to support I-9 form audits will mean the possibility that more businesses will be getting audited. 1. Write policies and procedures for maintaining files on all necessary HR forms, specifically I-9 forms. 2. Create a new employee checklist to ensure all paper work is in place before a worker begins employment. 3. Assign one person to be accountable for all HR files and incorporate the responsibility into the employee’s job description. 4. Create an HR file check-sheet to ensure all necessary documents are in place. 5. Conduct an annual HR audit of all employee files. 6. Maintain a file with annual audit results for easy access in the event of an outside audit. 7. Include audit reporting on a responsible employee’s performance appraisal. Auditors look for consistency in following policies and procedures. Organizations need to demonstrate consistency in completing I-9 forms as well as the file management process. Auditors also look for accuracy in documentation so it is important to pay attention to the detail of information required on the I-9 forms. An effective Human Resource Management process includes written policies, procedures and a consistent method for hiring new employees. Completion of the I-9 form is part of that process. Are you prepared for an I-9 Audit. Great article. Thanks for the info, it’s easy to understand. BTW, if anyone needs to fill out an I-9 form, I found a blank form here http://bit.ly/1ul6EfL. This site also has some tutorials on how to fill it out and a few related tax and legal documents. Great resource! Thank you Katherine!